Dr David Higgins is our first regular columnist. He is a scientist and conservationist working for the government of St Helena, and also spends time visiting other islands in the South Atlantic. 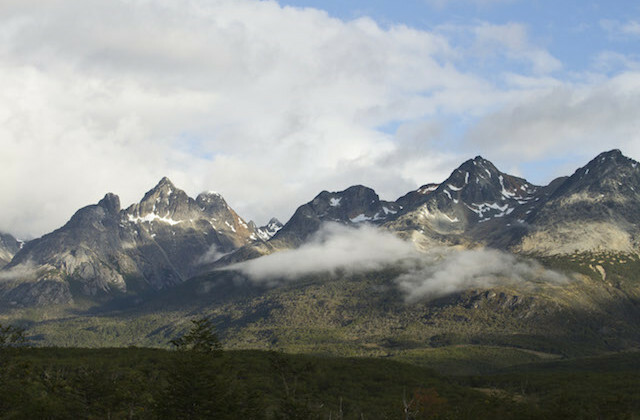 Here, in his first column, David travels through the strange landscape of Tierra del Fuego, an island at the southern tip of South America, shared between Chile and Argentina. Tierra del Fuego was always been a distant jewel in my thought, a place where adventures start, a desolate wonder, a frontier island. The ‘Land of Fire’ that hooks out of the Patagonian region of South America; the name a reference to the first people of this land, indigenous Fuegians, who burned fires in front of their huts. I’ve always imagined travelling this outlandish mass, half way between world and non-world, an in-between of realities. I drove there in February taking the crossing of Estrecho De Magallanes from Faro Punta Delgado to Bahia Azul. There I was in a cold dusk, a grand expanse of pampas drawing me in. The dark came slowly as I drove the deteriorating gravel tracks criss-crossing the land. 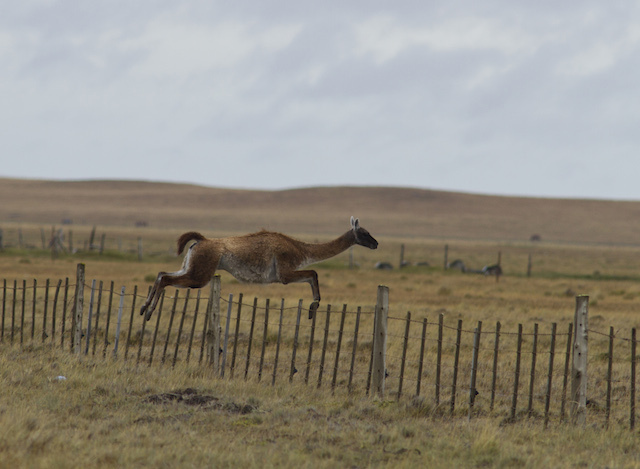 Guanacos came out of the grey. Their lazy runs exaggerated by long necks and spindly legs, road signs warning you to be aware of them. Porvenir is a weary town, corrugated tin buildings that must have looked old from the moment they were erected. The town radiates inland from the bay. One or two new houses gleam in the low sun. These are built with more modern materials, ignoring the temptation to create a tin shack. But as they gleam their dull future surrounds them. The artisan gift shop is closed on a Saturday morning. This is the height of the southern summer. The town was founded in 1833 by immigrant labour hot on the trail of a folly gold rush. Some was discovered but not in the quantities hoped, though they still work mines just out of town. There the streams have been dammed and large gullies are washed out from periodic releases of water. Today the town holds a little less than 5000 people, a regiment of the Chilean army and a high security prison. The first night at Porvenir I camped on the outskirts of town, parking on a wide verge. The only car to pass in fourteen hours times it perfectly to witness the froth of toothpaste as I clean my teeth in a half-light. The next night I book into the Barlovento Hotel. The receptionist who deals with me learnt her English in one month. A Canadian helped her. I don’t remember her name but our conservations brightened the evening. For a passer-through there are things to see and beaches to bog the car in. I drove along the south-west shore, taking the car over gravel and sands towards a ruined stone building. The car lifted over the gravel but slowed through the sand. I turned the wheel and steadied the speed till I got through. I watched steamer ducks and silvery grebes floating in the bay before turning back. On the return I bogged the car in soft sand. I dug it out from beneath the chassis and wheel arches and used the car mats to offer traction. I got nowhere. Then a teenager on a bicycle turned up. I don’t speak Spanish but my predicament was obvious and he helped. It took twenty minutes before the car was free and sat on top of the substrate again. I gave him 10000 pesos, clearly more than he expects but he received it with good grace before cycling off ahead of me. I drove in the other direction and parked alongside the bay. The pull-in was littered with empty alcohol containers. I could see how this place would drive you to drink. There’s a depressed look to the town; the grey rusting buildings and the bay devoid of boats offer a monotonous feel to the place. For those that come here for work the days must draw themselves into the grain of every frustration. Even the children’s parks are empty on a weekend. I watched the shags fly by, then took a better looking track that deteriorates with distance from the town. I found a wreck dragged up onto the upper shanks of the gravels. The words on the interpretation panel are somewhat lost in translation. It suggests the boat is an ancient vessel yet it rusts away on the beach. From here I watched southern skuas patrol back and forth. They hug the grass cleft just above the beach whilst the shags follow arrow flights over the shallows. The skuas track them following the more concealed route. The next day I left town to head south. I found no signs and ended up driving three roads before I orientated in the right direction. I was held up by a flock of sheep being driven by gauchos. There are more sheep here than I’ve ever seen before in one place. I waited twenty minutes before they all passed. I nodded at the men on horseback, in turn they lifted their hats. In the dark I went straight instead of turning left. A few miles down the track I found a pull-in where I slept. I woke as the sun was rising and the road goes on. Two Andean condors flew over the car. They dropped down into the pasture to my right, their shadows Tolkinesque. Still the road continues. I missed the turn to Argentina but the view to Lago Fagnano o Cami, close to the Argentine border where Tierra del Fuego National Park starts, was exceptional. Dead trees, barkless and sun bleached protrude from mossy swamps, a vast conifer forest extends through the valley. This is the most southerly stretch of the Andean-Patagonian forest. At its heart the vast strip lake nestles between the mountains. Waterfalls draw white lines down crags and cliffs as they feed it. The petrol gauge was at half, but I decided if I coasted down the hills I’d still make Argentina, then to Rio Grande where I could refill. The map showed this road petering out just before reaching Argentina. Ushuaia could only be fifty kilometres away but I couldn’t risk continuing in the hope it would get me through the border. So I walked, snapping photos of mare’s tail waterfalls, watching waterfowl and feeling heady in the wilderness. The air was cold enough to chill my innards but fresh and regenerating. Eventually I had to double back.